Looking for a little London chic in your Mummy life? All Mummas want to look fashionable, even if we don't always feel it, right? With all eyes on your child (or children), you might as well have something glamorous about your person when the odd glance does stray your way. Nothing quite takes care of the task like a desirable baby change bag - it's both a talking point and a symbol of modern Motherhood and femininity. Though it's contentious, there's nothing more lustful than stylish designer things from overseas too. Agree? Something from a good distance away from home just has an unmatchable magnetic appeal. 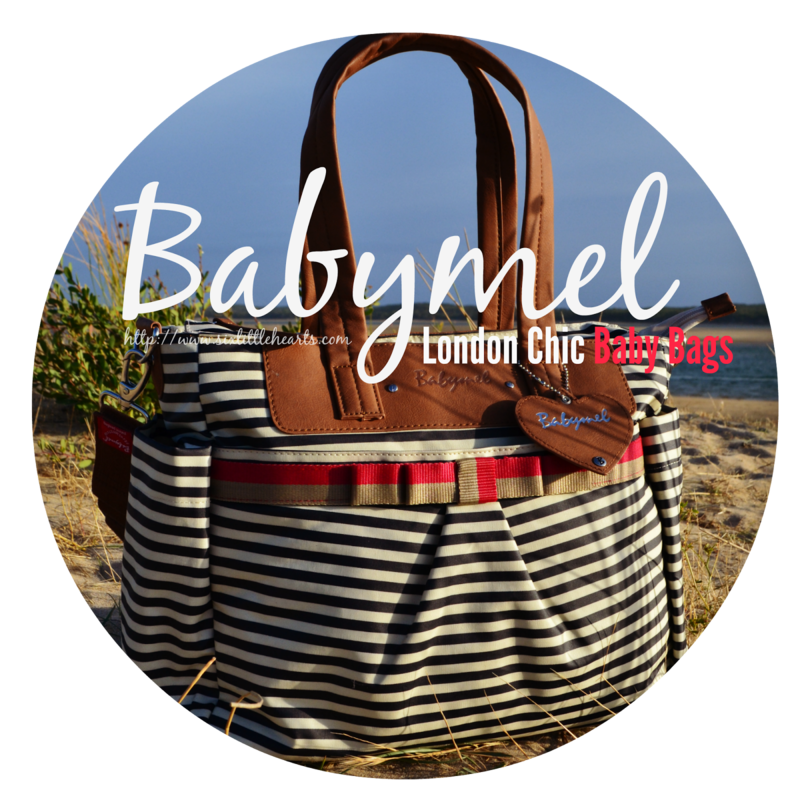 Babymel are a gorgeous baby bag company from good ol' London and they're happily available to buy on Australian shores at Incy-N - The official distributor of Babymel products in Australia and New Zealand. Babymel stepped into the Mummy and baby scene fairly recently in 2003 and their bags appeal to a youthful market: They're trendy, fresh, stylish and fashionable; and that's just on looks. As a serious product, they're very special and definitely make the grade in the comparison stakes. 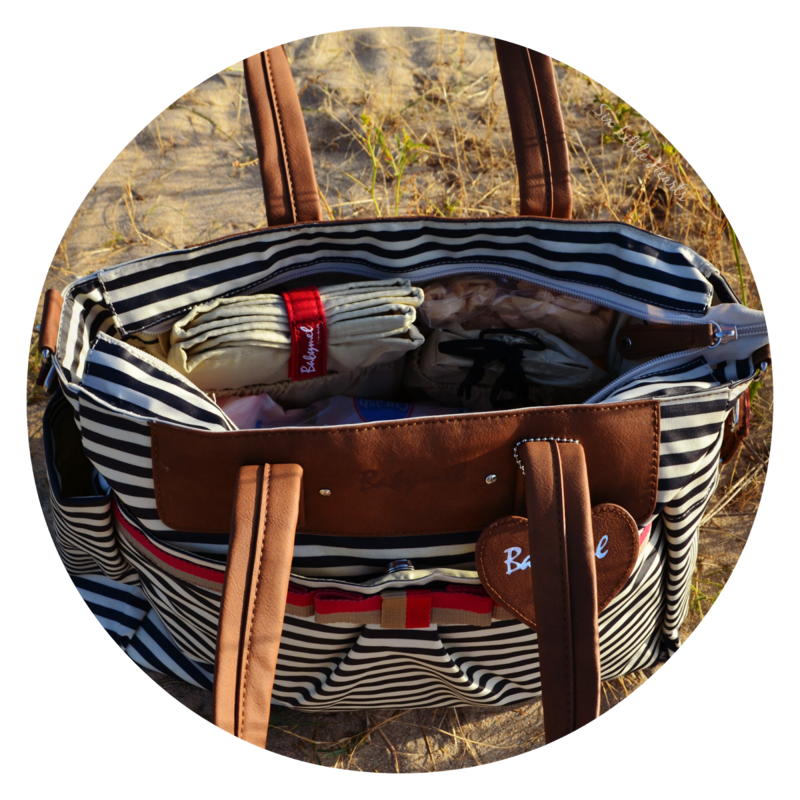 Meet Cara in Navy Stripe, pictured here a very long way from native London in Inverloch, Victoria. This bag is right at home here though. Being such a gorgeous casual beauty, she's perfectly suited to the Australian lifestyle. Stripes are never out of style and match anything and any colour, making her a versatile choice to suit any wardrobe or occasion no matter where you are in the world. The Babymel Cara is constructed in a thick coated wipe-able canvas with a pillowy-soft lining which makes it very comfortable to wear and practical around children. It moulds against your body no matter how you choose to wear it, be it over the shoulder or across the body with the removable shoulder strap. Yet magically, it never looses its shape. Try as I might, I can't seem to overstuff this bag either. It's quite puzzling! The baby bag is a fairly standard size at 31cms high, 45cm width and 15cms depth but no amount of contents seem to misshape it or over-fill it. Perhaps I have become a whizz at packing or maybe it's just clever design? Whatever the trick, I am really enjoying the freedom of using this in my day to day life with my kids. It's coping beautifully with all our needs and all the while, leaving me feeling good about myself too. Inside the trendy styling continues. 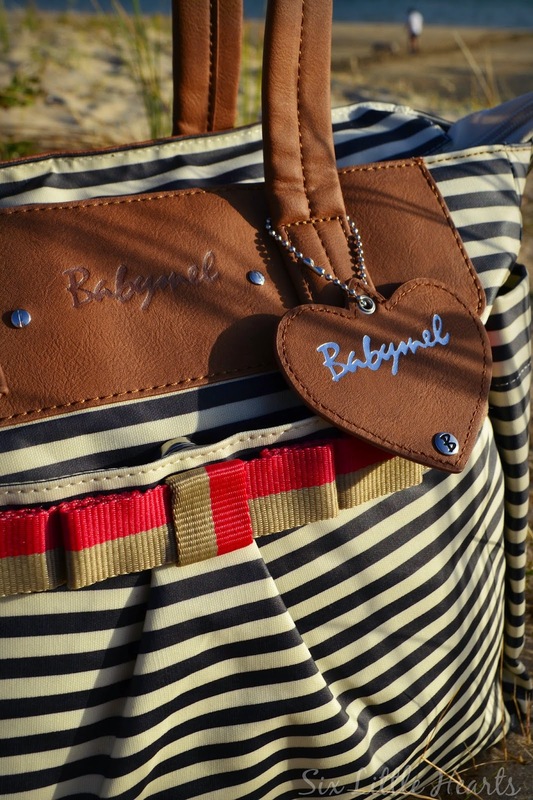 There's a beautiful satin beige interior embossed with a heart pattern, (hearts form the basis of the Babymel logo). There are pockets a-plenty, which are elasticised for cramming with whatever you require when on the run. The bag comes with its own quality, padded change mat and silver-lined bottle bag - both also decorated with the daintiest hint of hearts. The one big compartment interior gives you loads of packing freedom and the small inner zippered compartment in the bag's wall holds your most important items securely. A feature I really enjoy is the dedicated Mummy pocket on the bag's exterior which is a great place to store your own items safely, separate to your child's. This is fastened by a strong magnetic clasp and keeps everything conveniently at hand. There are two good-sized bottle pockets on the exterior - one for me and one for my toddler - just ideal! The shoulder straps are beautifully padded for comfort too. 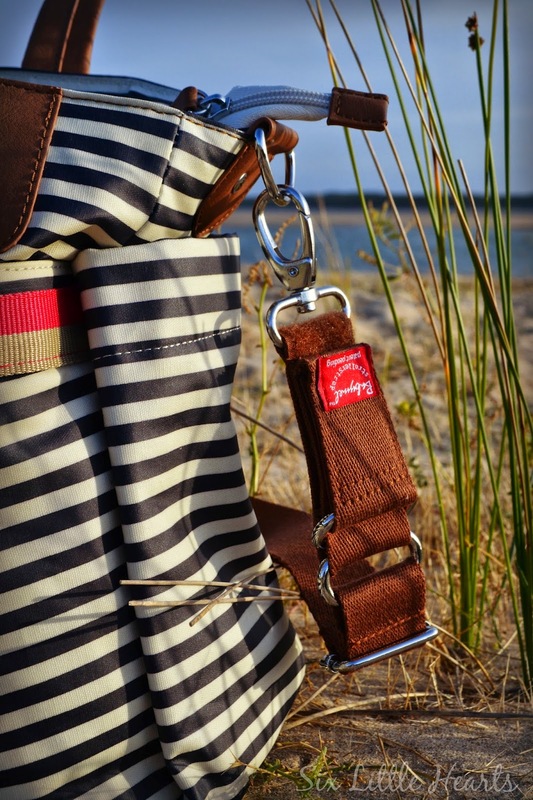 The pram hook attachments (Patent Pending), built into the main adjustable strap are worth a mention. These are nifty Velcro additions that are not separate to the bag in any way so no fiddling about for straps that may be tucked inside like other bags. Just undo the Velcro strips and attach straight to your pram's handlebar. I've never used a bag with such a great design feature! Vegans will love the all man-made materials of this bag too, which are of the highest quality. What more can I say about a really practical and fashionable bag? It's just great to look at and fabulous to use. Very, very chic and so effortless to navigate. The Babymel Cara Navy Stripe retails for a comfortable $145 and ticks all my boxes on style, function and price. Be sure to check out the full range of gorgeous designs from this trendy British company. *Disclosure: Six Little Hearts was gifted the Babymel Cara bag featured, for the purpose of review. Ahh this is timely post for me. With a newborn and little sleep anything to make me feel more glam in the day is welcome!!! In addition it looks like it is so roomy - need as much room in a bag as I can get! Thanks for the review! You would love it! Especially with a newborn - I seriously cannot stuff it! Totally understand. It will be extending it's life with this Mumma beyond nappies for sure! Ooooo I love that bag!!! This is just beautiful. Every mumma needs a decent bag to carry all the stuff that we carry. 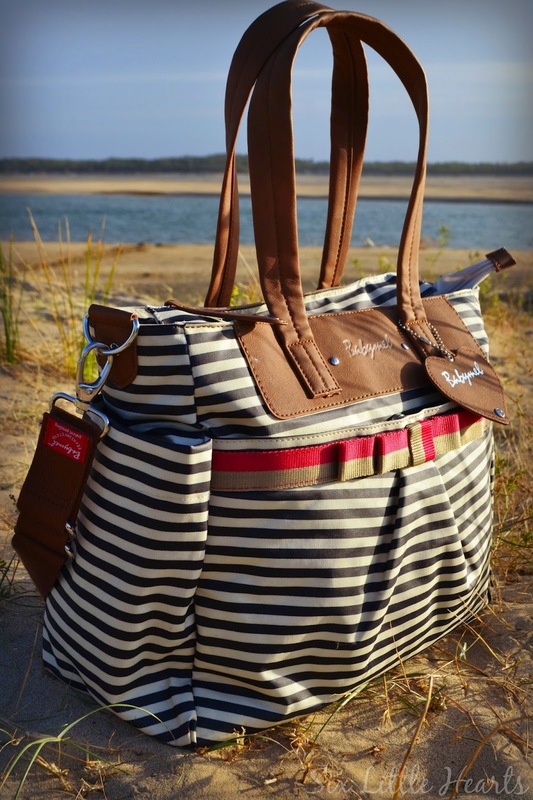 Sounds like a really gorgeous version of Mary Poppin's carpet bag! Much more space than at first appears. Looks stunning. I adore Mary Poppins' bag! Always say that whenever I see it in the movie! Stripes! Stripes are my favourite! What a great baby bag! Looks awesome yet is like the Tardis - bigger on the inside. Very necessary for it's purpose! Even has Tardis blue stripes! Awesome bag. really cute and practical at the same time. 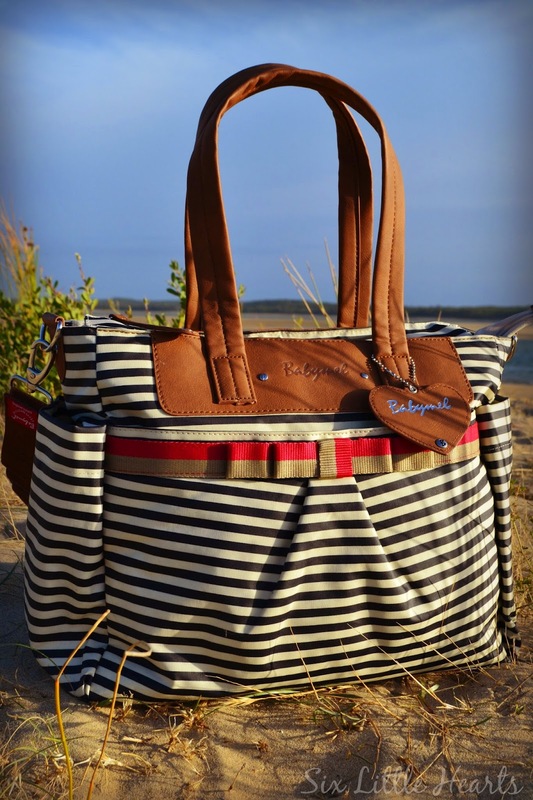 I love how stylish this bag is, awesome for a baby bag. Oooh, very swish and fancy! I was very daggy with my handbags when my boys were babies. Love how it's so practical too. Oh gosh you, another gorgeous handbag. I adore this one!